My two boys are huge fast food fans, but I rarely allow them to have it. Instead, I try to make hamburgers from home, both for taste and the family budget. I tire quickly of the same hamburger recipes so I am always experimenting with new combinations. The June issue of Better Homes and Gardens had a recipe for Blue Cheese Stuffed Burger with Red Onion and Spinach that looked out of my family's ordinary burger menu. This recipe takes very little prep, the only thing that has to be sliced is the red onion and then the hamburgers grilled. I grind my own hamburger meat using my kitchen aid, which adds an additional 10-15 minutes of prep, but I greatly prefer the taste to pre-ground beef. I used an indoor Foerman grill since our grill wasn't ready for the season yet. All the ingredients are easy to find and available at my local grocery store. My two boys liked this hamburger recipe. I liked that it is quick and easy recipe for a weeknight meal and takes next to no prep. My husband loved the grilled onions, but thought the burgers were dry on their own. I think when I make these hamburgers again I will add more blue cheese, making for juicer hamburgers. An easy weeknight meal! 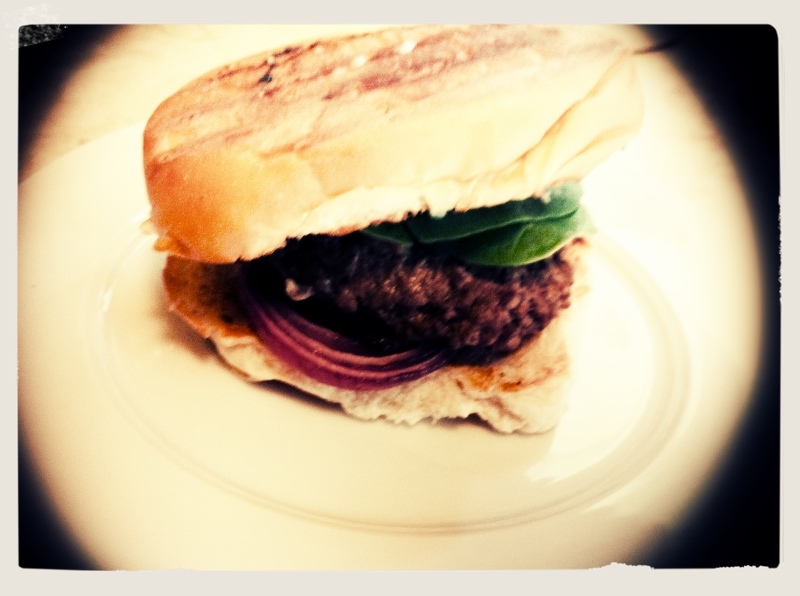 For the recipe go to Blue Cheese Stuffed Burger with Red Onion and Spinach. YUM! The hubby and I are all about dressing up the burger! One of our favorites is grilled onions and mushrooms w/ provolone cheese!!! :) New follower! Looks yummy! I love grilled onions too! Hamburgers are pretty popular here as well! Thanks for returning the follow. The burger looks tasty . @Yvonne sounds yummy, I love mushrooms! @Shana I'll go and follow you now!